Today we had a repair man come to the house to repair a recliner we purchased two years ago. We rarely have repairmen in the house since my hubby is very handy at fixing pretty much anything but since this piece of furniture has a lifetime warranty on the mechanism and that was the problem...Tom was here to put in the new parts. As you can imagine, our younger two were totally entertained by watching Tom install the parts. I'm almost sure I saw one of his ears fall off from their talking so much, telling him stories, asking him questions...you know, all the normal things we hear ALL day, EVERY day. It wasn't surprising that Tom was patient, after all he is a grandpa and has a granddaughter about the same age as the Princess. What was surprising is that as soon as he discovered that we home school our children, he went on and on about how great it is for children. This comes as quite a surprise because most people are not real encouraging. Tom, however, was very informed on what home schooling is and how it works! He talked about how well children who are home schooled do on tests, how most of them turn out as great citizens and just, in general, bragging on them. So...Tom, thanks for your encouraging words. You probably won't know how much you lifted my weary heart. Home schooling is hard and it's nice to have a cheering section. Recently we participated in co-op classes with our local homeschool group. 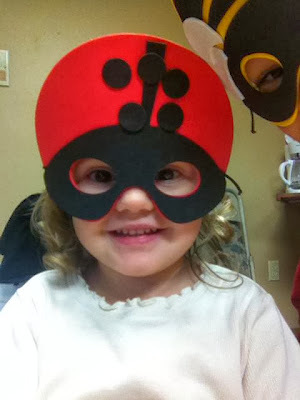 This cute little bug learned all about God's creatures with our good friends "Confetti" and "Cranberry." How many times have I made rice and it turned out to be a huge sticky mess? I can't begin to count the times! All I wanted was rice that sat nicely on a plate and I could put stir fry over or I could use it in fried rice, one of my favorite foods! Well, I've tried and tried and just couldn't get the hang of it. Now, finally after all these years, I've figured out something that works for me! EVERY. TIME! The great thing about this method is that it doesn't much effort and if you do a little planning, you won't be using any extra electric or extra appliances (yes, I almost bought a "rice cooker" before I discovered this method). The amount of rice doesn't matter...whatever you need for your family. 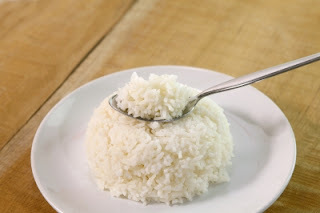 For ours we usually make one cup of dry rice so we end up with about two cups of cooked rice. You'll need a covered baking dish. If you don't have a regular casserole dish you can use whatever you have and cover it with foil but I prefer my Corning Ware dishes. Put one cup of rice in the dish and add two cups of water, add a dash of salt (if desired but it's not necessary) and 1 tablespoon of olive oil. Place the lid on the dish and bake it at 350 degrees for about 45 minutes. Turn off the oven and let it sit another 15 minutes. Fluff it with a fork and serve. Now the way I save on energy is I'll bake a dish or two of rice while I'm baking something else. If I'm not serving it with dinner I let it cool off some then I put it in the refrigerator for later use. Most of the time it becomes part of lunch for the next day when I have something that calls for cold rice...like fried rice! Here's another tip: If you are using it for fried rice, instead of adding two cups of water, replace 1/4 of a cup of water with soy sauce. Then when you make your fried rice the next day you won't need to add the soy sauce so you won't need to wait for it to evaporate when you are frying the rice. It really makes the rice crispy. I've been trying to be more creative with side dishes and use potatoes and rice a little less. I've been on a lower card diet for about 10 weeks now so I've had to get creative so we aren't eating the same things over and over. 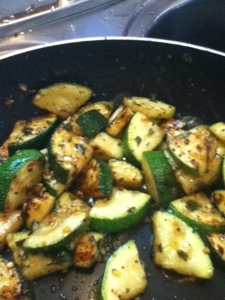 Today I made Sautéed Zucchini and it was a big hit, even with the one kid that says he doesn't like veggies much but just tolerates them! LOL! Anyway, here it is, I hope you like it! I've been looking for a recipe for a coleslaw dressing that we liked. My mom just mixes mayonnaise and vinegar but we didn't like that flavor much so I've been experimenting and we've finally decided on a winner. I just make it up as needed, there no reason to make up too much at a time. I'd say we have coleslaw about once per week and it only takes a few minutes to mix it up so it's fresh! Using a pint size jar, add three tablespoons of sugar, a teaspoon of salt and three tablespoons of vinegar. Shake or stir until the sugar and salt are dissolved. Add 3/4 cup of "salad dressing" (some people call all of the white sandwich spreads mayonnaise but if you look closely, there is actually two different products...we prefer the salad dressing version). After you've added your mayo or "salad dressing" put the lid on tight and shake it up. 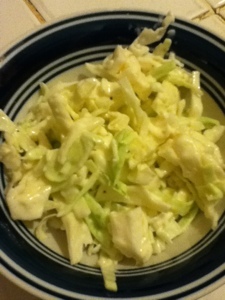 Right before serving, pour dressing over your shredded cabbage and carrots, then toss to coat. We used to buy the Kraft Coleslaw dressing but now we use this instead. It works out to be about 35c per mix and the Kraft is about $1.50 per bottle. 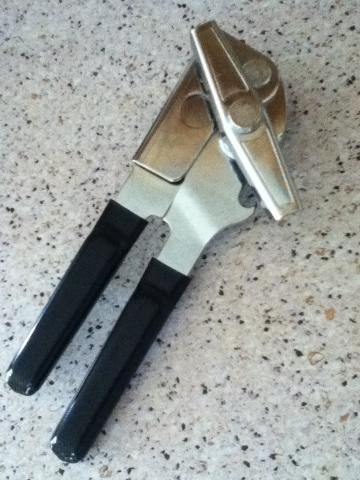 I was beginning to think our family was just really hard on can openers! Either that or we simply couldn't operate one correctly! We've tried several over the last few years trying to find one that will hold up without leaving shreds of metal around the top of the can or that doesn't mess up the can do bad you can't even come close to getting it open! Finally I did some homework! I planned on getting a quality can open that will open all size cans and last at least a year...longer if it cost was on the high side. So, I found one...it's called a Swing-a-Way and it's made by Amco. It looks a lot like one we had years ago but lost. Now the only problem was finding one locally because we needed one last week! After a little more searching I found a local dealer and purchase TWO! After just a few day I know this was a good purchase and I'm sharing the info with my friends. Ok...I'm sharing the info with anyone who stands still for more than 2 minutes! Today I am planning a "baking day" so I'll be making at least two loaves of bread and various other things like muffins, whole wheat buns, wheat rolls and probably some cookies. Since I'll be baking most of the day, I'll put dinner in the crockpot so I won't need to worry about it later when I'm tired! One thing I have done to make menu planning easier was to make a list of all the meals we enjoy. So far, I have about 42 meals in our rotation and I'll add to the list as we try new recipes and find more "favorites." This is what our menu looks like for the week. What will you be serving this week?